So, you've never programmed in AutoLisp before! You've tried to decipher some AutoLisp routines but, you are still totally confused!!! Let's see if we can't help you out. This tutorial will try and teach you the very basics of AutoLisp programming without overwhelming you with double-gook. 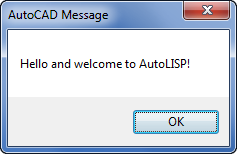 Well Done, you've just used AutoLisp to make AutoCAD do something. As you noticed using the (alert) function results in a dialogue box being displayed on your screen. Then choose a point anywhere on the screen. A "list" of numbers, looking something like this, should appear in your command window. This list, believe it or not, contains the x, y and z coordinates of the point you picked. values as a list in variable "a". Did you notice how everything is enclosed within parenthesis? All AutoLisp functions are surrounded by parenthesis. As well, AutoLisp allows you to "nest" your functions. This lets you write a function that evaluates another function. Now you can see why "Lisp" is often known as "Lost in Stupid Parenthesis"
You can also add comments to your coding. Anything preceded with a semicolon is not evaluated by Autolisp and is treated as a comment, much the same way as the REM statement in Basic is used. e.g. The statement we wrote earlier, told AutoLisp to get a point from the user and store the value in variable "a". The point list should be returned. So, any time that you would like to inspect a variable, just precede the variable name with "!" Type in each of these lines, one at a time, pressing "Enter" at the end of each line, then choosing a point. Press "Enter" then select a point. Again, Press "Enter" then select a second point. Press "Enter" again. A line should be drawn between the two points. The (command) function is used to tell AutoCad what you want it to do. a	From the point stored in variable "a"
b	To the point stored in variable "b"
""	Enter to close the Line command. Now this is very nice, but do we have to type in all this coding every time we want to use this routine? In Part 2 we will discuss how to "store" your programmes in a file.